Peche was the first of Donald Link’s restaurants that we tried, a seafood-centric restaurant in a town leaning heavily towards all things fished from the Gulf. The space is open and comfortable, the big windows along the street broadcasting light into the high-ceiling’d dining room. Wooden tables, sturdy chairs, the back-of-house glow of the grill in the passe. We came early for lunch, before we had to skip town, so the restaurant was just stirring to life, but a few older couples were already at the bar. Nice way to spend a boozy mid-day in New Orleans, that’s for sure. 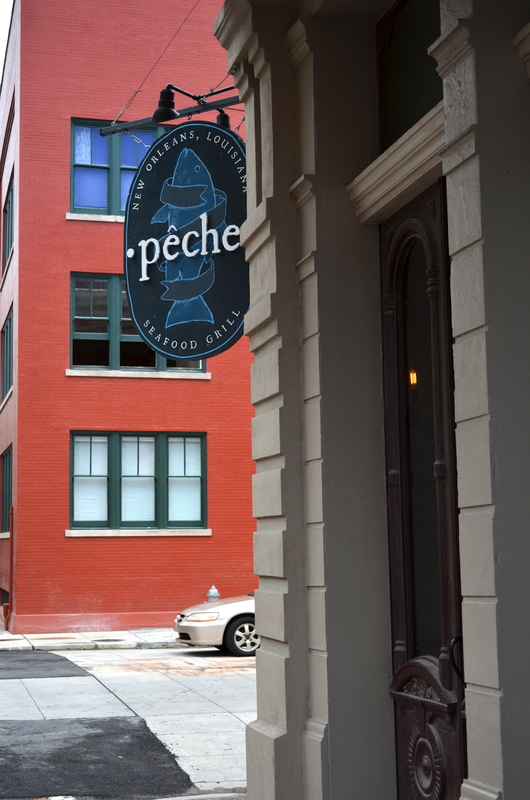 Better at Peche than some beer-soaked French Quarter establishment, I guess? But we came for lunch, goddammit, and lunch we were going to have. And lots of it. 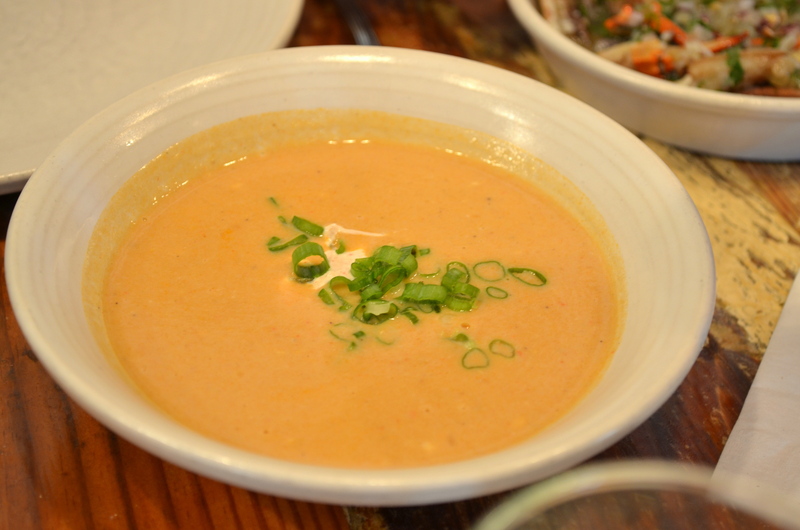 Starting with this corn soup. Myra ate all of this soup. She did not save much for me, but the one spoonful of soup I had was pretty good. Sweet and rich. 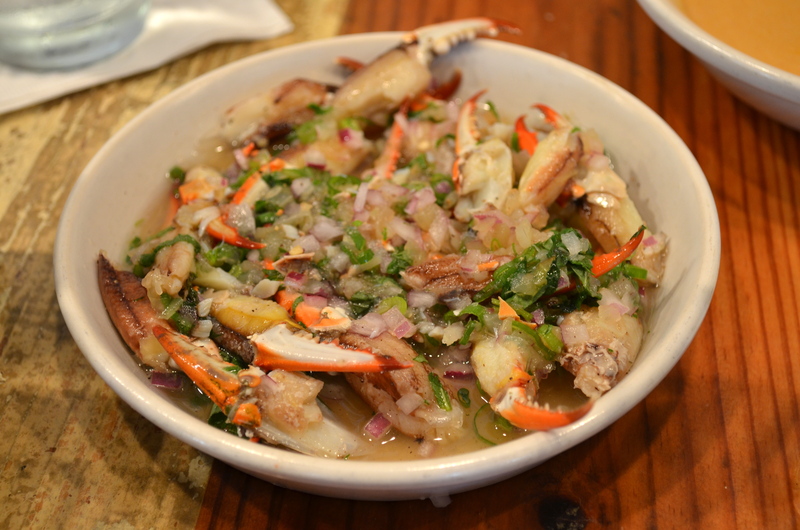 Crab claws, in a mint and shallot mignonette of sorts. 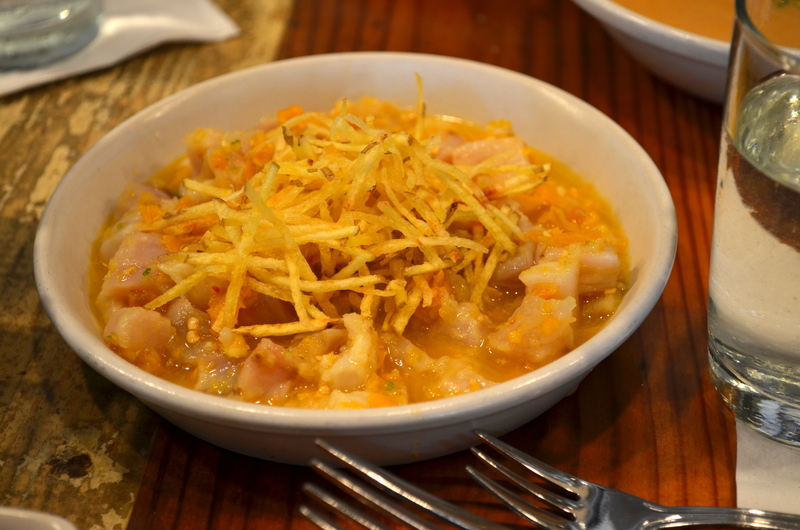 A white fish ceviche (I want to say hamachi?) topped with french fry sticks. Very citrus-y, not sure how I felt about it. The fish wasn’t all that noteworthy, was the main letdown. 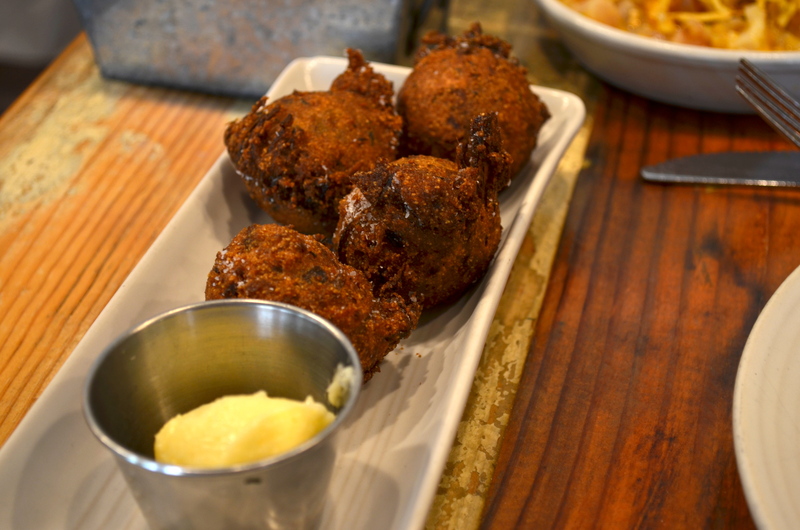 By god, these hush puppies. So good, crispy, hot out of the frying pan (or deep-fryer, I guess). Sprinkled with just the right amount of salt, and full of delicious herbs (I think scallions). Smothered catfish. 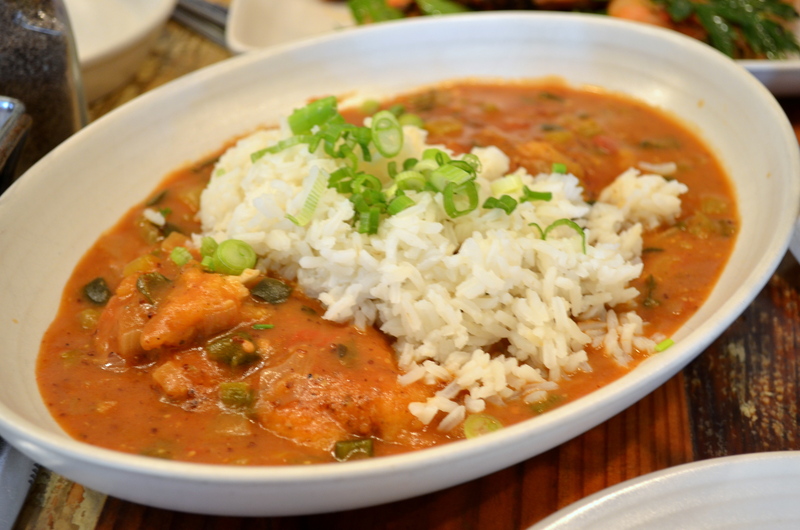 Pretty typical Cajun seafood dish – pretty tasty. The fish was very tender, and the red sauce had a little bit of kick to it. 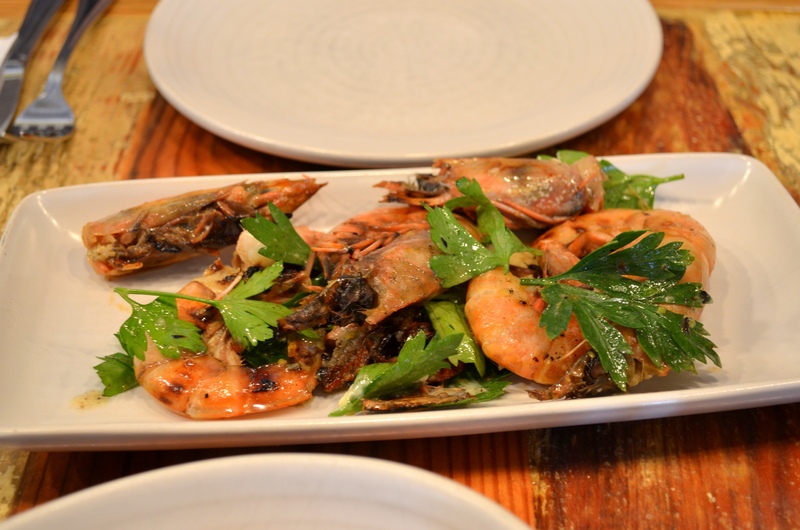 I will always go for some head-on shrimp. Grilled in whatever beautiful wood-burning contraption they’ve got in the back, these came out wonderfully juicy and savory, with enough shrimp head juice to make an Asian man smile. Or better. 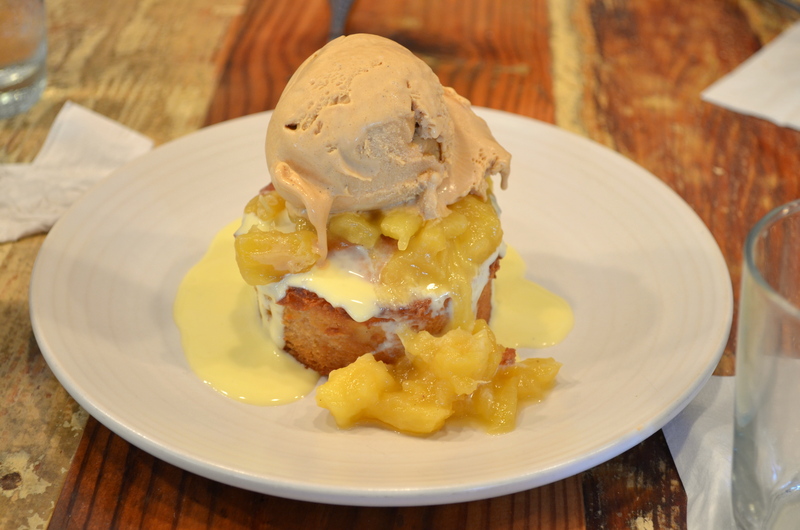 Phenomenal pineapple upside-down rum cake, with dulce de leche ice cream and caramelized pineapples. It’s slap-yo-momma good. What a send-off. That meal made us immensely sad to leave New Orleans, but also immensely happy that we are getting married there and therefore get to come back a lot.